The second annual edition of RESISTANCE Ibiza has announced the headliners for its nine-week, blockbuster residency at the biggest club in the world – Privilege – this summer. Adam Beyer, Carl Cox, Dubfire, Eats Everything, Jamie Jones, Joseph Capriati, Loco Dice, Maceo Plex, Nicole Moudaber, Paco Osuna, Pan-Pot, Richie Hawtin, Sasha | John Digweed and Seth Troxler will headline, boasting the event’s biggest lineup to date. 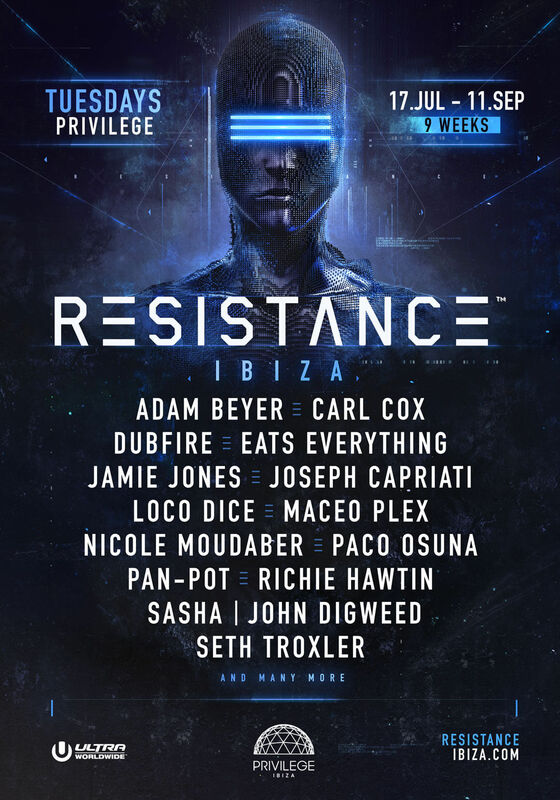 I am looking forward to coming back to Ibiza and playing for Resistance at Privilege for their second season. When I played there last, it felt like a brand-new club. The Funktion-One sound system and the lighting on this night makes it feel like no other club – it was truly amazing. I cannot wait to party and make history once again on the White Isle. RESISTANCE Ibiza’s ‘wildly impressive debut’ [Pulse Radio] was felt around the world in 2017, as critics lauded the ‘truly immersive experience’ [Deep House Amsterdam] for the festival-esque ‘mind-boggling custom production and phenomenal sound’ [Ibiza Spotlight] brought to the gargantuan venue. Returning this year every Tuesday for a full 9 weeks from 17 July – 11 September, the concept is bound to make even bigger waves this season.